I bought this wool cardigan at the start of Autumn after seeing it on the Jeanswest site, and I'm so glad I did as it's been really cosy for the cooler mornings. Being petite I wanted to try it on in store first before I bought it to make sure it didn't swamp me. I liked the way it looked and picked it up for 40% off. I love maxi skirts and dresses, and I credit my recent love of maxi cardigans on the Friends reruns on 9 Gem! I wore this after a really cold day and I expected this day to be equally cool. It wasn't and I was definitely overdressed in this when it heated up later in the day. The cardigan didn't stay on long as I ran between appointments. I optimistically had baby boy's 6 week checkup in the morning followed by my post birth follow up with a physio. Last worn: Ray-Ban Wayfarer, wool cardigan, blue floral shirt, skinny jeans, gold mouse flats, purple mini MAB tote. Other ways to wear: maxi cardigan and flares, blue floral shirt in the office, skinny jeans layered up for winter, gold mouse flats in the office, purple mini MAB tote and a pink dress. Another printed shirt, cardi and jeans combo. Although not the best outfit for the weather, I liked the first outfit combination so was happy to try it again. Busy morning taking baby boy for a checkup and spending time with my family in the afternoon. I'm so pleased I picked up this cardi - especially as I snagged it on sale before it started to sell out. 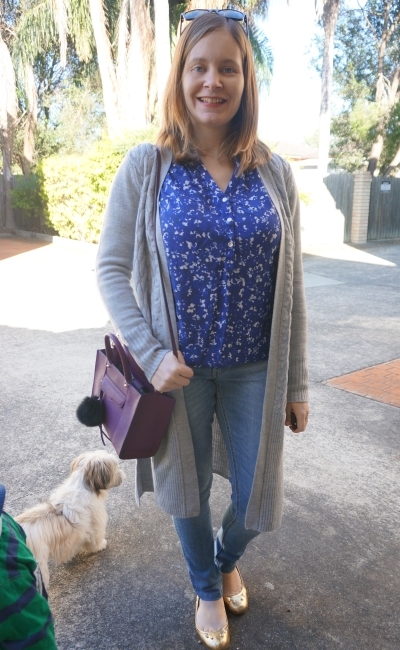 I did wonder if the wool would be too warm for our mild Brisbane winter weather, but it's a lovely layering piece that keeps me cosy on a cool morning but doesn't feel too bulky. I'm pleased I bought this, it's been worn a lot already. My bestie sent me the very cute Coach twilly I tied on my bag. I loved the way it looked, however the knot I tied kept coming undone so I'll have to think of another way to wear it that keeps it safe from little grabby hands. I wear my Hermes twillies as bracelets around my wrist sometimes, but that's not ideal for life with baby. Last worn: wool cardigan (above), mixed print shirt, red skinny jeans, silver ballet flats, Rebecca Minkoff Love bag. First time I've worn the twilly as it was a recent gift. Other ways to wear: long cardigan and navy tank, mixed print shirt and shorts, print mixing and red skinny jeans, silver ballet flats and a wrap dress, Rebecca Minkoff Love bag and a maxi dress. Linking up with Passion for Fashion, The Ultimate Rabbit Hole, Let It Shine, Shoe and Tell. that long wool cardi looks great in both outfits...the first one is so lovely and chic, but I think I prefer the second one because I'm a great fan of bold colours and those red pants just pop!!!! you look great...very fresh! Who would have guessed you gave birth not too long ago? btw both of these bags are to die for...that purple one is so wow and the grey one is very elegant. hehe, thank you! I'm lucky baby boy likes his sleep so I often get 4 uninterrupted hours at night. This cardigan looks so comfy and yet stylish. You look amazing. Oh and I like your new Coach twillie, such a nice bestie! That cardigan looks awesome on you Mica! Did they have it in other colors? You should get it in black also. LOL Looks so good and what a great deal. It also looks soft & comfortable. Love it with red girl! You look great! hehe they only had it in grey - probably a good thing for my bank balance! Oh man, those tantrums.... Ours are just starting to get bad. So far, we've only had one in public, I can't imagine how rough it is with two little guys! haha Hang in there! Tantrums can be so tricky....I guess I'll report back on how I handle it in public with two little ones wen it happens. It's sure to be soon, haha! I have a long cardigan but it's very light and I definitely need a heavier wool one. It didn't even crossed my mind that I needed one but after seeing how versatile it is and how easily it goes with many outfits, I am convinced I need to add one in my wardrobe. Wow, Mica, I'm loving the way you've styled your wool cardigan in both these looks, so stylish! I honestly can't say I love one more than the other, I'd wear both of them! Thanks so much for sharing and I hope you have a great weekend ahead, beauty! I picked up a maxi cardigan while I was in the UK - I love it. It's like a Goldilocks cardigan; not too thick, not too thin, but just right! The cardi looks lovely on you. I am not sure a longer carid would suit my round shape, but my eldest daughter also looks lovely in one. Give it a try! :) I am pleased I tried this one on instore, wasn't sure how it would work being petite. Congratulations on baby number 2! I am a huge fan of cardigans. They are the only good thing about winter. Thank you :) I like winter layering, nice change from summer although it won't be long before I"m missing the heat, haha! What a versatile piece! It looks great on you! This is a very stylish cardigan hun. Pairing it with the jeans is a great idea. I also like your idea of reviewing items twice. There's no reason we have to buy something new for every single post. At least that's my thoughts on the matter anyway. Oh definitely! I'm always rewearing things, I'm just sharing what I actually wear and no-one wears every outfit just once (except maybe a celebrity, ha!). That cardigan looks super cozy and chic! And it looks great with both outfits! The wool cardigan looks like an excellent addition to any wardrobe and goes well with both looks. Your post reminds me I should get out my red jeans and pink jeans soon. Loving the gold Marc Jacobs flats as always. I would love a pair of pink jeans! :) It's certainly jeans weather here in Brisbane. Cute outfits! I too need to try on oversized/long pieces to make sure they don't overwhelm me, so I could definitely relate to that struggle! Yes, the problems of being petite, haha! Hehe cute doggie in the background! I love long cardigans, they're cozy and practical! I really like your second look, I want to get some bright red jeans too! This is a perfect work outfit. I love long wool cardigans, they are amazing for layering and so comfy around the house as well. I love this long wool cardigan and you look great in both outfits! 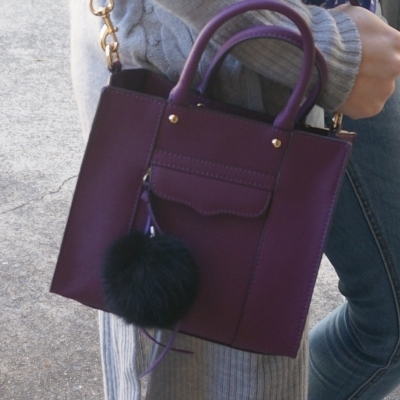 I am crazy about the purple bag in the first one! Thanks for sharing these looks! Those red pants look so good on you! I would love to wear the red pants as well but I don't know what to match with haha. Great cardigan! It looks great with both outfits! Great red jeans, too! That is a great cardigan! I love those style of things for layering. Your greys and reds in the second outfit make for a really fun combo. In the second look I really like your red skinny jeans and that cardigan is always good to have in hand because it's stylish,but also keeps you nice and warm. Why is your little pooch always looking at something in the background? Haha. He's so cute. Love your outfits! 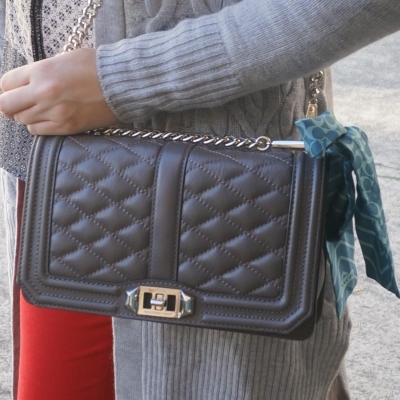 love the maroon bag, really cute! That grey and red outfit is so striking ! I love that color combination! The "Ruby" blouse is so cute - love the mixed prints.